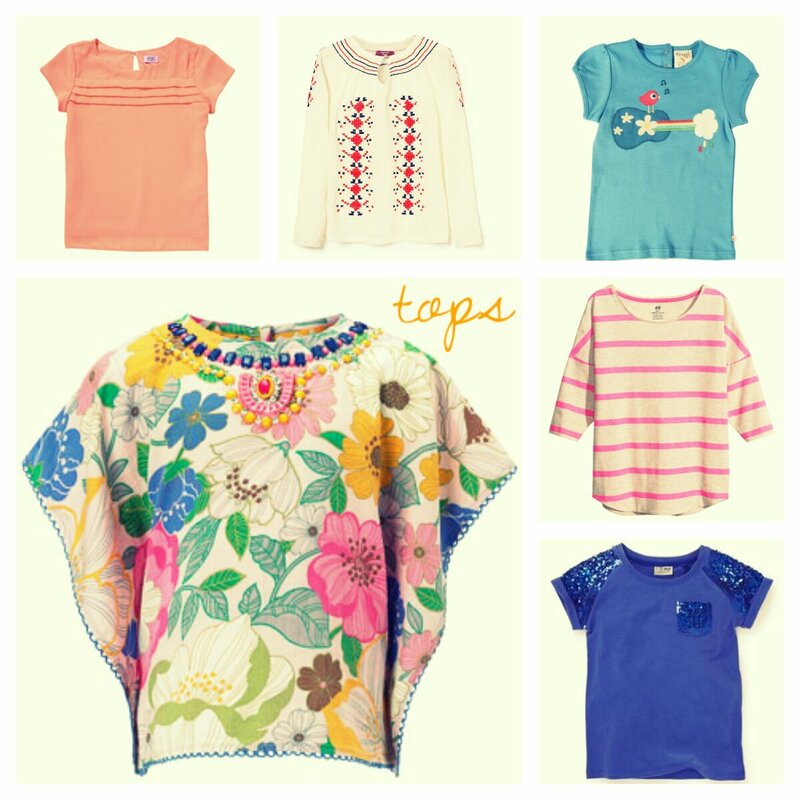 The summer holidays are coming, which means no school uniforms and a chance to wear clothes that you like! At Jump we love fun clothing that lets girls express themselves, (and climb trees! ), so we’ve picked out some bits and pieces to give you some ideas. We haven’t forgotten you boys, either – check out next week’s post for the best t-shirts, shorts and shoes around. Bikinis, tankinis… there’s some funky swimwear around at the moment. 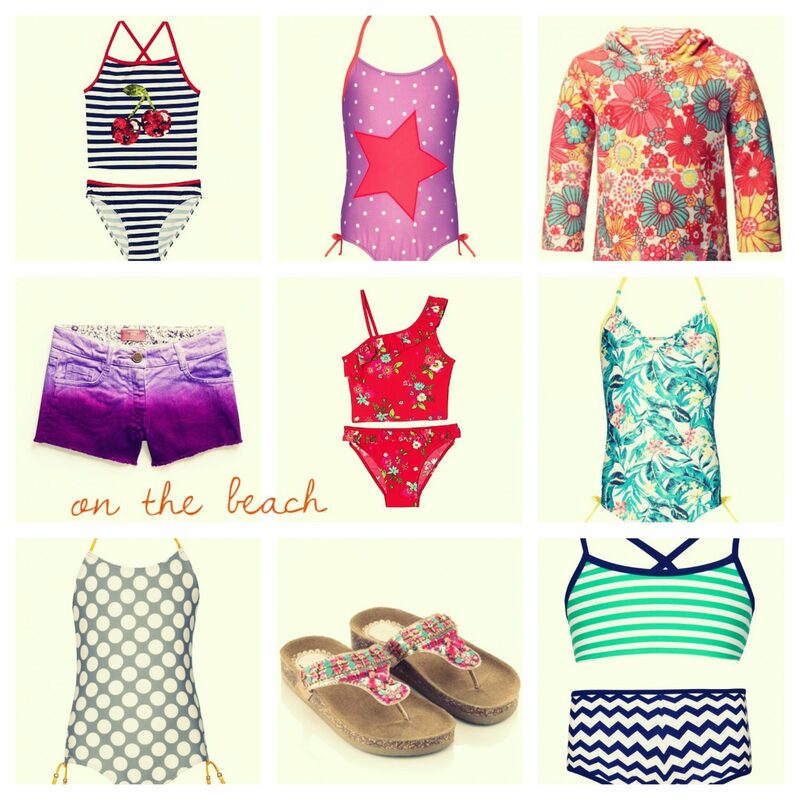 Mix and match with two piece suits like the red floral one from Debenhams, or go for a fun patterned swimsuit – M&S have some great ones. Just got out of the sea? A colourful cover-up like this towelling jumper from Monsoon will help you dry off while protecting you from the sun’s rays. All you need to do is sling on a pair of cool dip-dye shorts and some beaded sandals, and you’re good to go. There are hundreds of tops in the shops, so why not go for one with a bit of personality? This floral one is beautiful but lightweight, and the embroidered top is perfect for protecting yourself from the sun while keeping cool. Even t-shirts aren’t so basic if they’re in a nice bright colour with a few snazzy details, like the bird and guitar tee or this sequined one from Next. Check out next week’s boys’ post too for some more t-shirt ideas. We all know that British weather is a bit unpredictable, but keeping warm on a grey day needn’t be dull. A jumper in mango, turquoise or even acid yellow is a great way to keep yourself feeling sunny, even if the weather outside is not. We also love this short-sleeved nautical sweater from Next. 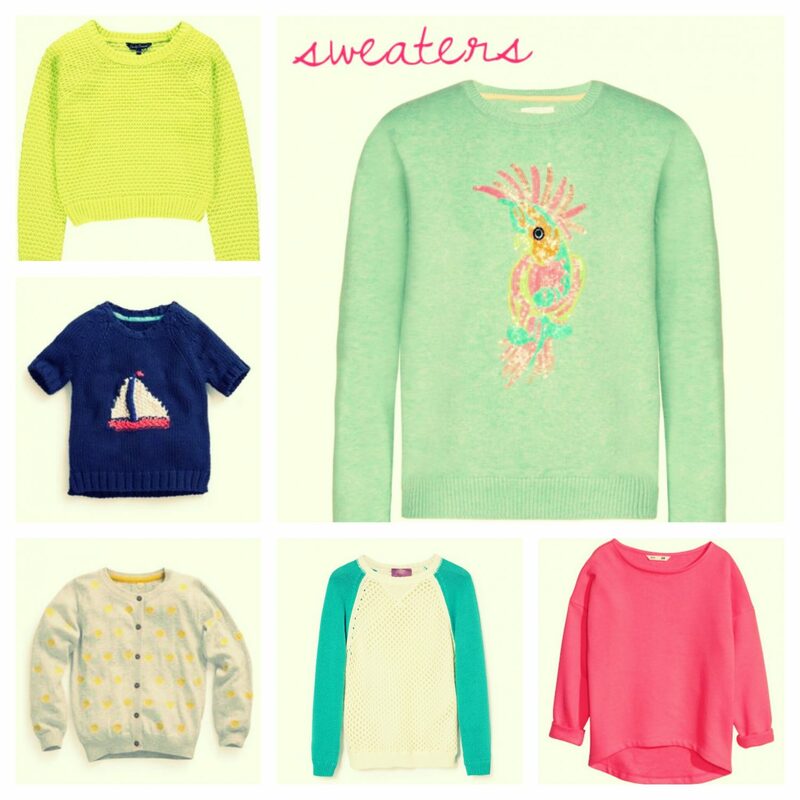 And check out the amazing sparkly parrot jumper! 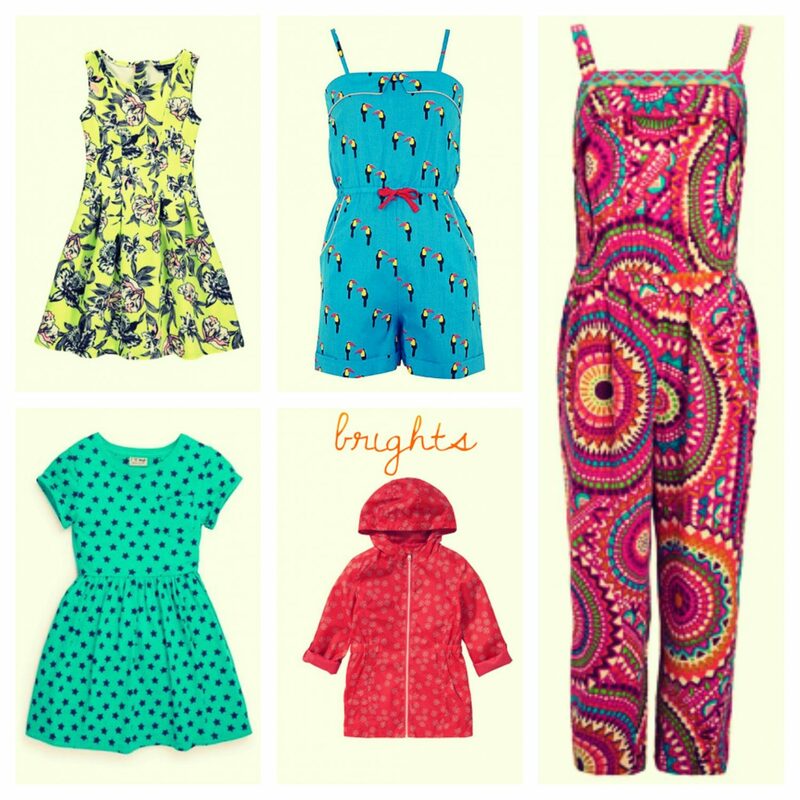 Be as bold as you dare with bright colours and prints! These playsuits are fun and striking, and are a better bet than skirts if you’re climbing or just running around. If you’re more of a dress girl, there are tons around in every pattern you can think of – have fun choosing one that you love, whether it’s parrots, parasols,stars or stripes! Denim is hard-wearing, so good for playing outside, but it doesn’t need to be basic. 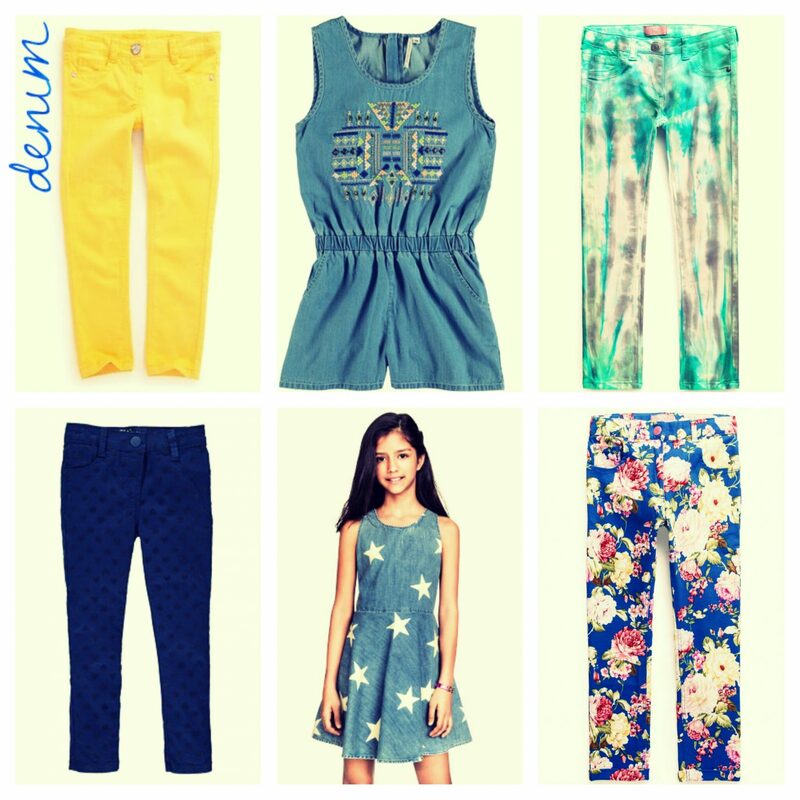 Try floral, tie-dye or polkadot jeans, or go for a cool denim dress. We particularly love the banana yellow jeans – they’re the perfect summer colour! 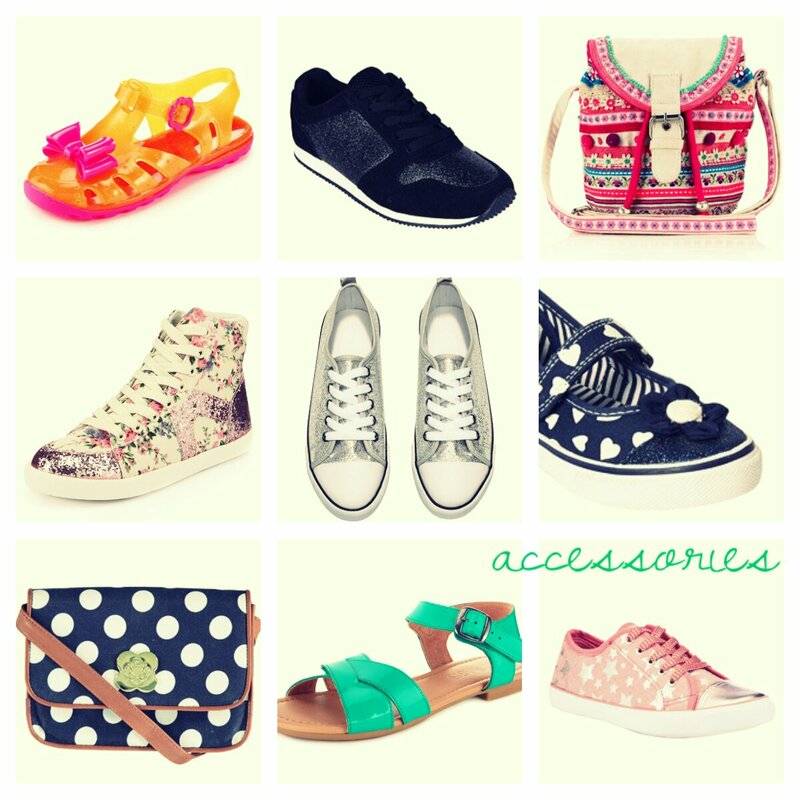 Shoes and bags are a fun way to express yourself, but they can be practical too. Cross-body bags let you carry your book or phone around while leaving your hands free to, you know, do stuff, and trainers don’t have to be boring. You could go for full-on glitter with these amazing floral hi-tops, or be a bit more subtle with these black sporty trainers. If sandals are more your thing, the green ones are lovely and won’t fall off your feet every five minutes, and these jellies even change colour! What do you like wearing in summer? Great items of clothing, at shops I visit regularly fantastic!